Pathe is today launching the very first trailer and poster in support of the film’s release. The British cast is led by Hugh Bonneville (Downton Abbey, Paddington) as Lord Mountbatten; Gillian Anderson (The X Files, The Fall) as his wife, Lady Mountbatten; Lily Travers (Kingsman) as their daughter, Pamela; and Sir Michael Gambon (Harry Potter, Quartet) and Simon Callow (A Room With A View, Four Weddings and a Funeral) as key civil servants. It is a story that is deeply personal to Gurinder, whose own family was caught up in the tragic events that unfolded as the Raj came to an end. The film’s story unfolds within that great House. Upstairs lived Mountbatten together with his wife and daughter; downstairs lived their 500 Hindu, Muslim and Sikh servants. As the political elite – Nehru, Jinnah and Gandhi – converged on the House to wrangle over the birth of independent India, conflict erupted. A decision was taken to divide the country and create a new Muslim homeland: Pakistan. It was a decision whose consequences reverberate to this day. The film examines these events through the prism of a marriage – that of Dickie and Edwina Mountbatten – and a romance – that between a young Hindu servant, Jeet, and his intended Muslim bride, Aalia. The young lovers find themselves caught up in the seismic end of Empire, in conflict with the Mountbattens and with their own communities, but never ever giving up hope. VICEROY’S HOUSE is a film that is both epic and intimate, with an inspirational message that celebrates tolerance. Many of the events depicted are either unknown or forgotten, but all have strong contemporary relevance in terms of lessons to be learnt concerning the politics of division and fear, the origins of religious extremism, and our moral responsibility towards migrants fleeing violence for a better life. 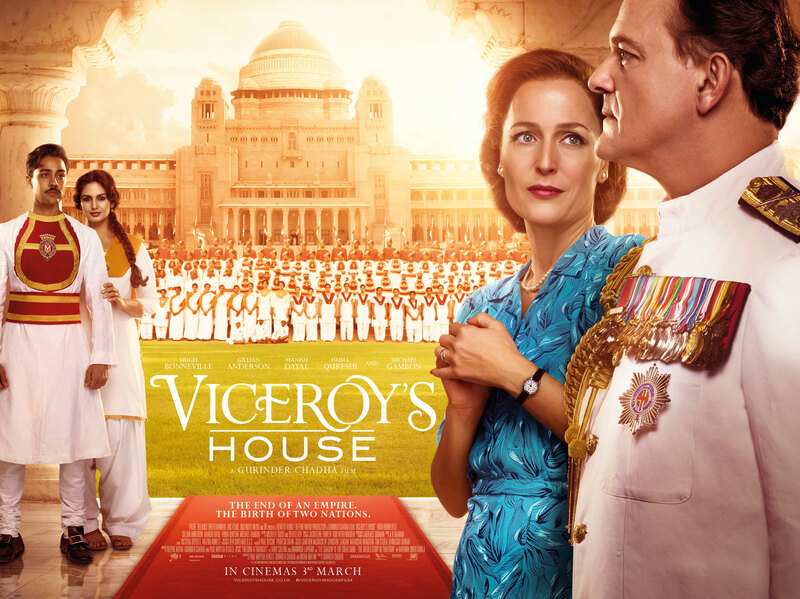 VICEROY’S HOUSE is directed by Gurinder Chadha (Bend it like Beckham) with a screenplay by Gurinder Chadha, Paul Mayeda Berges and Moira Buffini, and is produced by Deepak Nayar (Bend it like Beckham, The End of Violence, Buena Vista Social Club), Gurinder Chadha and Paul Mayeda Berges. The film is executive produced by Pathé’s Cameron McCracken, Reliance’s Shibasish Sarkar, BBC Films’ Christine Langan, the BFI’s Natascha Wharton and Ingenious Media’s Tim O’Shea. The film is a Pathé, Reliance, BBC Films, Ingenious and BFI presentation of a Bend It Films/Deepak Nayar Production in association with the FilmVast and Filmgate Films.